… with some new work for the upcoming season arriving daily. Preston at his exhibition, Raven and the Box of Daylight, with our group! 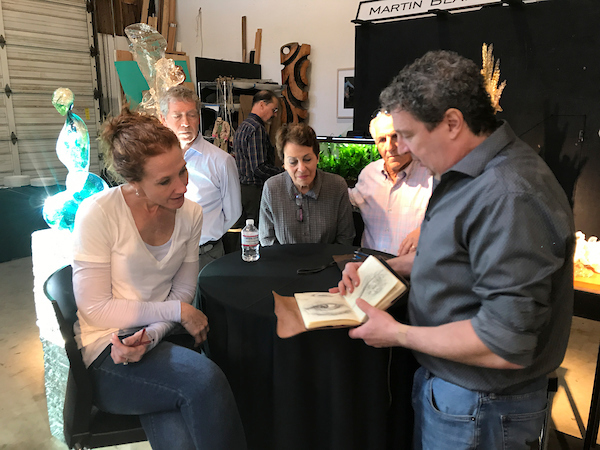 Our Seattle Glass Tour this March was amazing and inspiring. The five-day tour is an opportunity for an up-close and personal view of artists’ studios and hot shops. This included the Chihuly Boathouse, where we were able to witness two fantastic Macchia pieces being made. At the Glass Museum in Tacoma, Preston Singletary guided us through his exhibition, Raven and the Box of Daylight. The group photo above was taken in the gallery of his ancestors. Richard Royal in his studio. Meeting professional artists in person is a very special experience, as these studios are not open to the public. 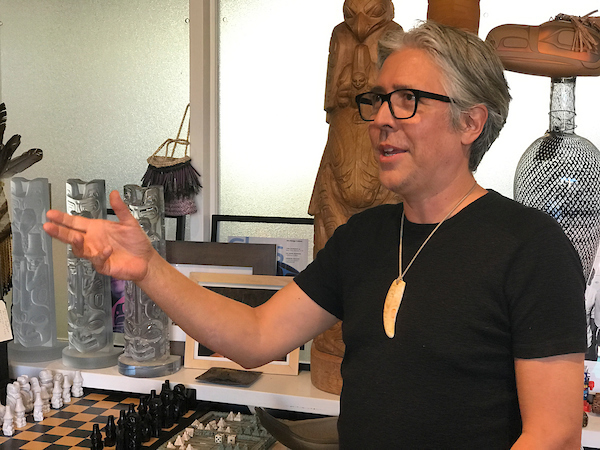 As a collector, making a connection and learning up close and personally about the different processes and techniques enriches the relationship with the art. David Huchthausen explaining his procedure for cutting, laminating and polishing the glass. 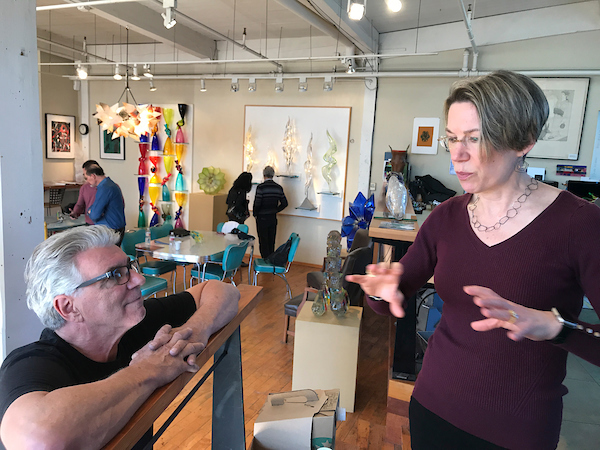 Artists enjoy sharing their time and meeting these enthusiastic glass tourists; there are always great questions and perspectives exchanged. New work in the studio of Kait Rhoads. 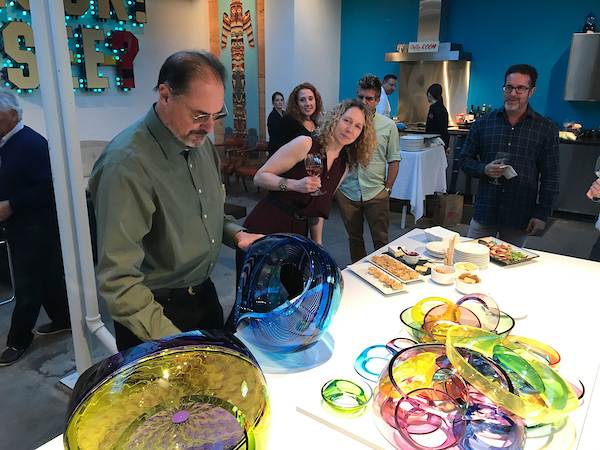 It is what we do as a gallery for our artists, clients, and the gallery… to help foster a better understanding and appreciation for the passion of making and collecting glass art. Martin Blank sharing a glimpse into his sketch book. This trip also affords Jim a chance to personally select new work for the gallery for our upcoming busy summer season! hmmmm…. this will be nice for the gallery! a blue collaboration between John Kiley and Dante Marioni! At the Tacoma Museum of Art, we met Debora and Benjamin Moore. 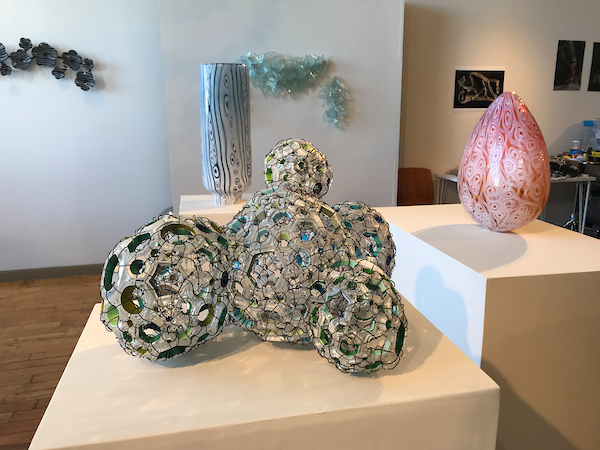 Debora introduced us to her new installations of large-scale work on display, and we had the opportunity to tour the new Benaroya Wing with the extensive contemporary glass collection. 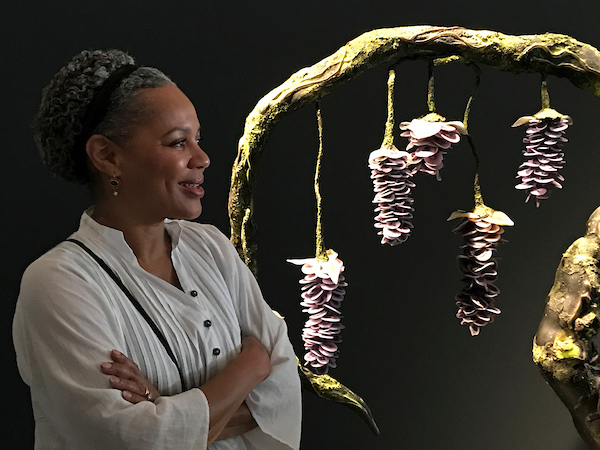 Debora Moore at the Tacoma Museum of Art with her installation, Arboria. There are so many creative people involved on the glass blowing teams and in the cold-working shops. 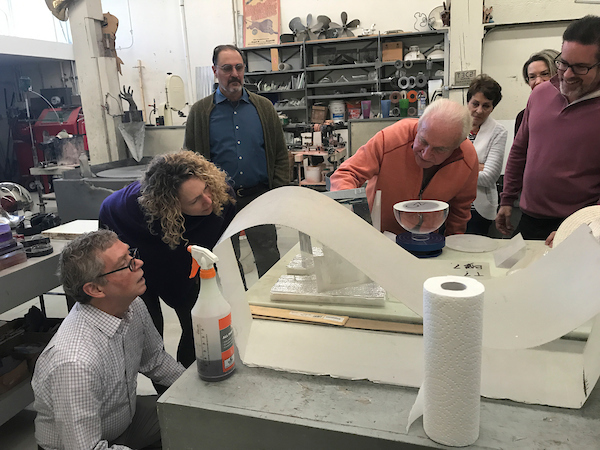 On this tour, the artists and studios we visited who we also represent included: Dale Chihuly, Lino Tagliapietra, Rik Allen, Shelly Muzylowski Allen, Martin Blank, Nancy Callan, Jason Christian, Benjamin Cobb, Dan Friday, David Huchthausen, Jasen and Karen Willenbrinnk-Johnsen, John Kiley, Dante Marioni, Benjamin Moore, Debora Moore, William Morris Studio, Kelly O’Dell, Ross Richmond, Kait Rhoads, Richard Royal, Preston Singletary, Raven Skyriver, Veruska Vagen, and David Walters. Other venues we visited were: Chihuly Garden and Glass, Museum of Glass Tacoma, The Tacoma Museum of Art, and Pilchuck School of Glass, where we met the new Director, Chris Taylor. These, and 2000 other photos, are taken by one of our travelers, who is also an excellent photographer, Michael Stubblefield. A big THANK YOU! to Michael and all the excited participants who journeyed on that 5-day tour and had the best time learning about glass, meeting the artists, touring around Seattle and dining on excellent food… and believe it or not, it did not rain! This year is the 25th year for SOFA Chicago and we are proud to say that Jim Schantz has been there for 23 of those years! Unbelievable!! Lino Tagliapietra has stated that SOFA Chicago is the most important show to present his newest creation, and he works towards that goal. When in the windy city, he enjoys meeting his fans, seeing long time friends, and the fine dining in Chicago. We hope to see you there and share these and other exciting works by the Maestro with you. Here is a catalog of a selection of works to be presented – be sure you view full screen to get the full effect. Raven Skyriver also brings awareness to the fragility of the ecosystem and the risk of endangerment in his breathtaking glass animals. Icons of the Pacific Northwest such as whales, tortoises, seals, and salmon feature prominently in his vocabulary, along with ancient shelled creatures and undulant octopuses. He expertly manipulates glass to express different textures—soft mat seal fur, rough patchy tortoise skin, glistening chromatophore’s cells, iridescent carapaces. Skyriver’s glorious creatures capture a panoply of forms and colors as diverse as marine life itself. Though Skyriver consults reference books and deliberately plans the shapes and coloration of each sculpture to achieve naturalistic accuracy, he also distills each creature to its essence and relishes the whimsical accidents of glass that can augment a piece. Skyriver suggests swimming bodies in their native marine habitat by giving the sculptures fluid movements reminiscent of real life—stretched necks and expansive flippers pushing through the water, arcing backs diving under the surface, waving tentacles riding the ripples. The inherent viscosity of glass, its ability to morph in shape and color, and its seeming weightlessness as light filters through and around it, make it the ideal instrument for Skyriver. Though he originally did functional pieces in the traditional Venetian style, it is through working with glass that he has found his artistic voice. For him, there is great joy in making beautiful renditions of animals, bringing awareness to, and helping safeguard, the creatures with whom we share our planet. There is also great passion for both the medium of glass, an intriguing substance with many characteristics to learn and cultivate, and the process of glassmaking, a team effort that allows him to collaborate with creative talents. Raven Skykriver’s glass sculptures immerse us in nature, allowing us to contemplate our mortality and encouraging us to change our way of being in the world. Humans cannot halt, but in fact will eventually be folded into, the inevitable circle of life. But humans do have a choice if they want to be forces of destruction or agents of preservation. Veneration of nature defines glass artist Kelly O’Dell. O’Dell was raised in Hawaii, where the arts (her parents had a stained and furnace glass studio in their home) and the lush environment were woven into her upbringing. Kelly O’Dell sees nature in the long view—its far-reaching past, its captivating present, and its precarious future. Just as the phenomena of past millennia are written in the planet today, the actions of the present create ripples going forward. The Ammonite was a coiled cephalopod that became extinct 65 million years ago when a comet hit the earth near the Yucatan peninsula, altering the weather dramatically and making most life unsustainable. Exquisite shells were left behind, empty homes to animals no longer alive, embedding their intricate patterns in the earth. O’Dell mimics these fossilized impressions in panels, liquid glass melting like a massive glacier, suspending shell slices in perpetuity. Exposed anatomy is writ in delicately blown and sculptured turquoise, maroon, and golden glass, shapes juxtaposed with one another in elegant formations such as butterfly wings. Kelly O’Dell, (R)evolutions: Chorus, 2017, Sculpted, cut, and cast glass, decal inclusions, gold leaf. Glass optic bricks rotate on stand, moveable by hand. In other work, O’Dell revives the Ammonite in glorious dimensions. Glass is blown in varying thicknesses, carved to move light effortlessly through the helix-like form. With her sumptuous palette—at times opaque and creamy, at times delicately transparent, at times dusted with luster—the work blends realism with an aura of fantasy. O’Dell brings this amalgam of scientific accuracy and artistic license to endangered sea creatures of today such as coral, concerned that human impact on the natural world will mimic history’s astronomical disasters. The viewer’s eye dances around the craggy textures, milky colors, and clustered forms of her coral, compelling us to protect this threatened species. Themes of extinction and preservation invariably reflect back on the self and our own mortality; O’Dell’s glass pieces memorialize nature’s lost glories, endeavor to forestall future destruction, and contemplate the universal life cycle of life, death, and renewal. Elaborate and exquisite colors, patterns, and systems make nature a marvel of design. Abundance and majesty make it a source of inspiration and tranquility. Its continuum of birth, death, and renewal make it a symbol of life’s transience and mortality’s inevitability. Nature strikes a delicate balance between strength and fragility, sometimes stalwart against, sometimes victim to, the folly of humanity. Nature strikes a delicate balance between the seen and the unseen, sometimes displaying its glories proudly, sometimes teeming imperceptibly beneath the surface. Artists who take inspiration from nature inherently understand these qualities and act as stewards, honoring and preserving our planet. Though Paul Stankard graduated from vocational school and worked various jobs in industrial glass early in his career, his creative side loved artistic things like poetry, and the wildflowers of his native rural Massachusetts. One of his favorite Walt Whitman quotes says that “the narrowest hinge of my hand puts the scorn on all machinery.” It is an apt description for someone who transitioned from mechanical work to fine art so successfully. He was drawn to the floral paperweights of 19th century France and present for the revival of this art in southern New Jersey in the mid-20th century. One of its finest practitioners, Francis Whittemore, happened to be Stankard’s factory supervisor. The two loved to talk about this common interest, though Whittemore shared few insights on his methods of production. So, Stankard applied the glassmaking techniques learned on the job to years of self-study in the art of paperweights to become a pioneer in the field of flameworking. Realism in his botanicals (carefully sculpted petals, pistils and stamens, and lovingly rendered insects) is coupled with mysticism and imagination (roots that morph into people and mosaic canes spelling words like “seed” or “wet” embedded in the design). The works are simultaneously referential to the idea of what a flower can be, and metaphors for the sacred life cycle of creation and destruction. Hot, viscous glass fills the crevices like dripping honey, crystallizing in the surrounding orb and creating a reverential memento mori in permanent suspension. Exhibiting 25 new works at Art Palm Beach this January 14-21. Meet the Maestro! Also, Pilchuck Director, Jim Baker will present a Tribute to Lino during the Speaker Series. Prosecco Reception to follow at Schantz Galleries booth #308. Contact the gallery for a VIP pass or a catalog… while they last!